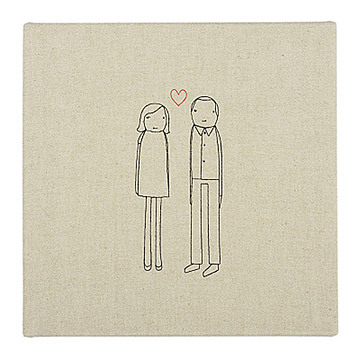 Celebrate your favorite couple with this custom textile art. The fabric of every great love story? Special romantic quirks. This custom textile artwork is a special way to commemorate that romance with personalized embroidery. Select the faces, hairstyles and clothing for your characters from options that best reflect the twosome. Ranging from casual clothes to wedding attire, each figure has an appealing, childlike charm. Comes ready to hang. Handmade of stretched flax and organic cotton canvas by Mary and Shelly Klein in Michigan. This picture is just a sweet and romantic expression of my affection towards my husband. The size was bigger than what I expected, but it is actually perfect in my bedroom, above the nightstand. Our room has a lot of pictures from our wedding day, so this was a complementary addition to that theme. I bought this for my boyfriend for Valentine's Day. He was really touched. He hung it up in the living room. We're still together so that a good sign. Easy to personalize. A memorable gift. great wedding gift. canvas is much lighter in the photo which is more attractive, but is still a great gift and unique. Also, the artist worked really fast! we received this less than 2 weeks after ordering it. overall, very pleased. I am giving this product to my husband for the birth of our first child. I had the artist add a baby between us with the heart over our heads. They were very accommodating. It came out so amazing. It is a perfect personal gift. My husband loved it! It has made a great addition to our wall and reminds us daily how much we love each other.